Tuesday once we said farewell to Nathan, Jeff, Marshal, and John at the train station we filled our afternoon with real life things like grocery shopping and laundry. My focus needed to shift from having fun with friends to writing and preparing to lead our Writer’s Group on Friday. I had put a plan together (at least in my head) of how I would schedule my days. You know what they say about the best laid plans. Lisa a business colleague of Bob’s was in town and we decided to invite her to our home for lunch. Bob has told her so much about the vineyard that we really wanted to show her. So, Wednesday we brought her up to the village for lunch. It was a lovely afternoon and I was happy to finally meet her in person. Lunch in Spain is never a short thing so that was Wednesday afternoon gone. 🙂 I am not complaining. We had a great time! While we were enjoying our time together we told Lisa about the open-air market in Sant Sadurni which takes place on Thursday. We must go! So, Thursday morning we picked her up and headed to the market. 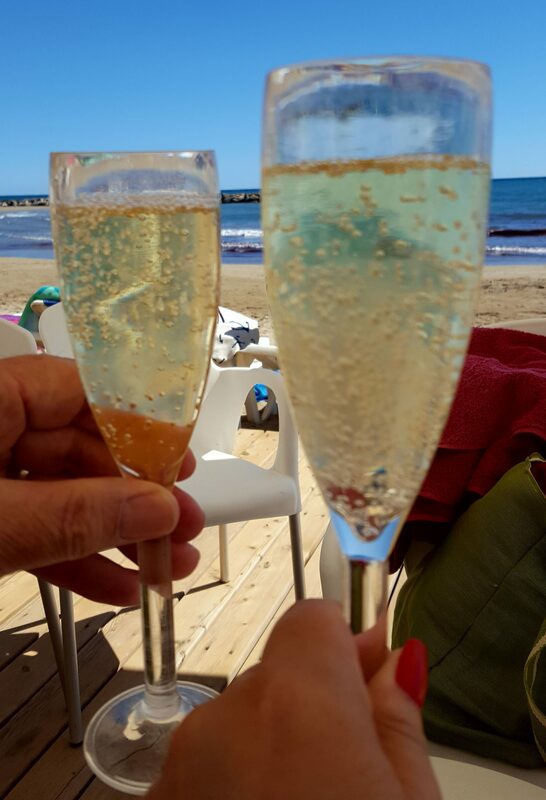 Sant Sadurni is the cava capital and Lisa loves the bubbly! We had to stop and have a glass of cava. It was hot and all that shopping makes you thirsty. Okay, we didn’t need any excuses. We introduced her to the rostisseria chicken and potatoes. A little take-away for lunch that day. I love Sant Sadurni. How can you not love being surrounded by cava wineries and vineyards and the street bumpers are shaped as cava corks. We dropped Lisa off early afternoon and went home to enjoy our yummy chicken and potatoes. Then I got to work. Some writing and prep for our Writer’s Group. Where did all my work time go? Next postAnd there goes Friday!